The following are the guidelines set by California State Department of Education for enrolling children in age appropriate classroom settings. A child must be 2 years old by September 1st to be admitted and placed into the 2 year old group. We accept non potty trained 2 year olds. A child must be 3 years old by September 1st to be admitted and placed into 3 year old groups. To be part of this group children must be potty trained. A child must be 4 years old by September 1st to be admitted and placed into 4 year old groups or Pre-Kindergarten. A child must be 5 years old by September 1st to be admitted and placed into Kindergarten. Class assignments will be made by the school administration with teacher recommendations. The school administration reserves the right to make changes to class composition, including but not limited to reassigning children to other groups. Each child will have a seperate file containing enrollment, health and other confidential information. These files will be kept in locked cabinets in the school office to ensure confidentiality. Only parents, the child’s teachers and the administration will have access to these files, except as otherwise required by law. The school reserves the right to admit and /or to disenroll any student for any reason it its discretion. The school operates on a 10 month School year and follows the calendars of the Western Prelacy of the Armenian Churches of America. 3-4 year olds / one adult to every 8-9 children. 4-5 year olds / one adult to every 8-10 children. 5-6 year olds / one adult to every 12 children. L & H Tavlian Preschool and Kindergarten’s Curriculum is based on Developmentally Appropriate Practices with a thematic focus. By creating different levels, the program enables teachers to adjust the curriculum to meet the developmental needs of the child. These levels are designed to align with Jean Piaget’s Preconception and the Intuitive stages of development. This means a child’s development takes place in an orderly and predictable fashion where each child develops at his/her own pace and each child has his/her own learning style. These levels allow for sequences that occur due to natural maturation, others occur through the child’s experiences as they get older and others because they are inherently and logically related. Furthermore, L & H Tavlian Preschool and Kindergarten has an eclectic approach and classrooms are based on interest centers. The daily schedule consists of a good balance of child initiated and teacher directed educational activities. Children have an opportunity for exploration and play outdoors. In Preschool, we offer a learning environment, which emphasizes the following five developmental learning domains. Cognitive development, Social development, Physical development, Language and Creative development. Motor Skills: Children have daily opportunities to use large muscles by running, jumping and balancing. L & H Tavlian Preschool and Kindergarten is licenced by the State of California to serve the needs of children ages 2-6 years. 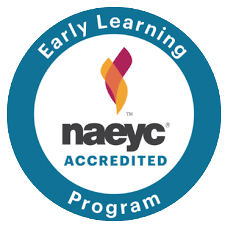 It is also accredited by National Association for the Education of Young Children (NAEYC) since 2000. Our school provides children with well balanced meals (breakfast, lunch and snacks). Our nutrition menu is designed with the approval of the State Department of Nutrition program. Please avoid sending chips, chocolate, candy, gum or other unhealthy snacks with your child. It is your responsibility to inform the staff of any known food allergies your child may have prior to admission. Children will be given an opportunity to participate in occasional field trips to enhance their learning. A flyer will be sent home by the school to the parents describing the details of each field trip. Field trips are considered to be part of the class activity, however parents may opt their child out of such participation. By signing the Consent Form at the time of enrollment, parents also give their child premission to go on School field trips. Parents who do not wish their child to participate in field trips, must inform the School during enrollment or at any time after enrollment. Parents are encouraged to accompany their children during these educational trips, however parental participation is not mandatory. For each field trip, the school provides transportation with commercial school buses and nutrition for parents and children. To prevent program disruption, we ask that parents who accompany their children to field trips refrain from purchasing additional items from merchants or vendors at the field trip location. All school rules, regulations, policies and practices will be in effect during field trips. Parents of students who participate in School field trips or excursions are responsible for any and all associated costs. All individuals making the field trip shall be deemed to have waived all claims against the school and its teachers, administrators, and staff for injury, accident, illness or death occurring during or by reason of the field trip or excursion. While conducting the field trip, the teacher will have a first aid kit in his or her possession. Before participating in any field trip the school will have a signed parent permission form, Waiver of Liability and Consent for Medical Treatment on file. Depending on the needs of community and availibility, Levon & Hasmig Tavlian Preschool and Kindergarten may offer 3 to 6 weeks of Summer School during Summer Vacation. Summer School provides fun programs, such as water play, art and cooking. In addition to fun programs, for older children (5 and 6 year olds) the school offers English, Science and Math Classes.